Most core benefits require that you are a regular employee hired to work a minimum of 19.5 hours per week (0.52 - 1.00 FTE). However, some benefits have additional eligibility criteria. Please select specific section for eligibility criteria. You may also call The Human Resources Division at 423-778-7969 (select Option 2) with any questions that are not addressed in the sections above. The department is located at 1516 Riverside Drive. 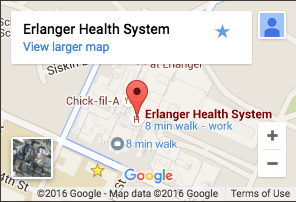 Erlanger associates can dial ext. 7777 for shuttle service from the main campus.